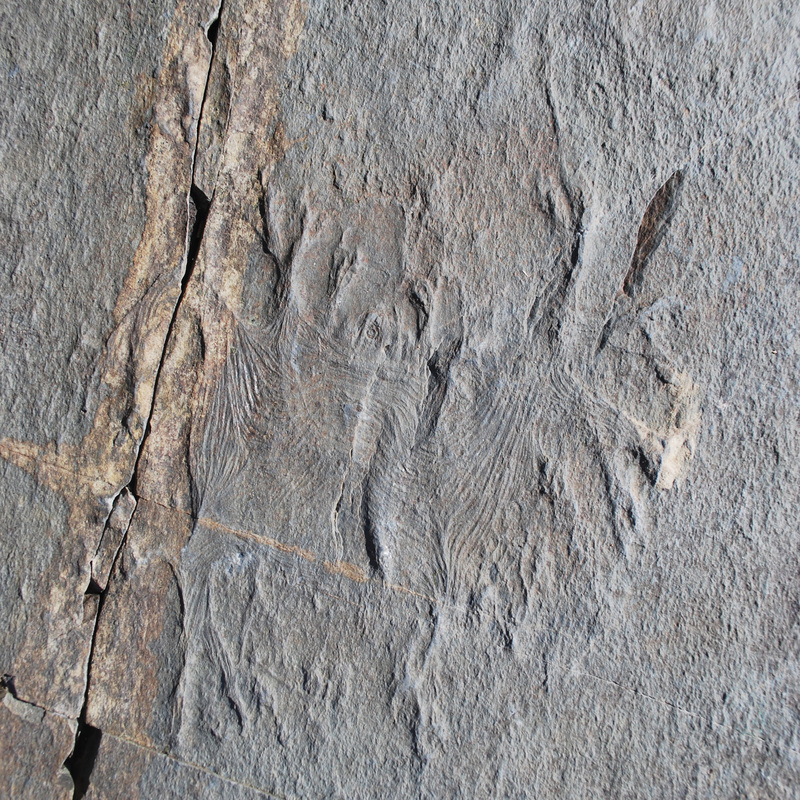 Haootia quadriformis is unlike anything previously described from the Ediacaran Period. Known from only two specimens on the Bonavista Peninsula of Newfoundland, Haootia possesses a fibrous body plan consisting of a central radial disc anchoring the organism to the sediment; a short stalk; and a quadrate body with fibrous bundles, with dichotomously-dividing branches in each of its four corners. A series of smaller subsidiary branches emanate from its lateral margins. The original authors interpreted Haootia's fibrous bundles to be evidence for muscular tissue, and suggested that the four-fold radial symmetry, muscle tissue, and morphological and taphonomic similarity to modern and fossil cnidarians support a cnidarian biological affinity (Liu et al., 2014). Haootia is considered to have had a benthic mode of life, and appears to have been a rare but evolutionarily significant component of Ediacaran marine ecosystems ~560 million years ago. Holotype specimen of Haootia quadriformis, Back Cove, Newfoundland. Image courtesy of J. Matthews. 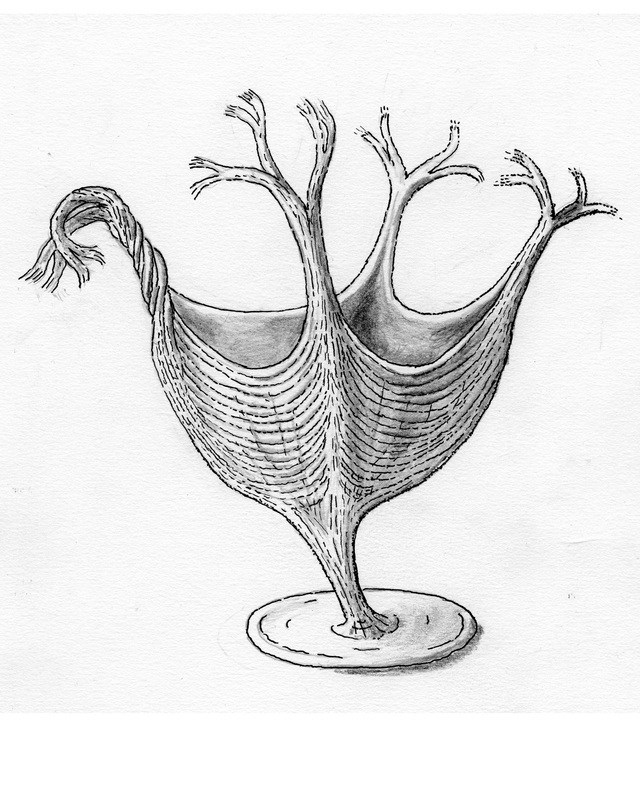 Artist's reconstruction of Haootia quadriformis in life, suggesting a body plan similar to that of extant Staurozoans. Image by M. Brasier. Soft-bodied, quadrilaterally symmetrical organism possessing a smooth discoidal structure connected by a relatively short stem to a quadrate body comprising numerous regularly aligned linear fibres. The fibres extend laterally across the body, linking adjacent corners. Converging fibres extend beyond each corner to form an elongate branch, which divides dichotomously to form smaller, distally tapering sub-branches. Smaller branches also emanate from the lateral margins of the quadrate body, and these too branch dichotomously.